Admiral Stainless Steel Bottle Chiller: Keep your wine chilled and fashionable at the table with this contoured and double-walled stainless steel bottle chiller. 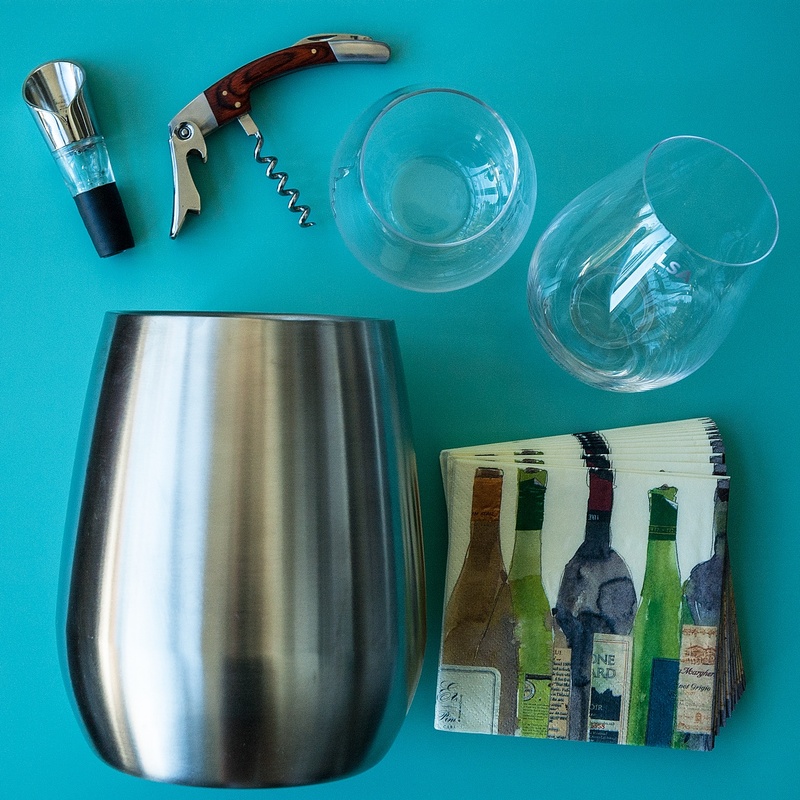 Keeps white wine or champagne frosty until you are ready to serve. Fits standard bottles. Measures 7.5-inches tall. Rosewood Stainless Corkscrew: The perfect wine bar accessory to stylishly open you latest vintage. Carefully handcrafted by artisan, this beautiful rosewood handled and stainless steel item is precisely crafted for opening your bottle successfully. Viski Professional Aerating Pour Spout: This little gem affords you the time to enjoy your wine rather than waiting for it to decant. A great little gadget for all wine enthusiasts. The aerating spout air-blending helix lets the vintage breath as you pour. Measures 3.75-Inches. Stainless steel pourer and rubber stopper base. Stemless Wine Glass Pair: Simple in design, excellent functionality, our stemless wine glasses are weighted perfectly, so they feel wonderful in your hand as you enjoy your favorite wine. Mouth blown in Poland, we assure you these could become your favorite. Measures approximately 4-inches in height and holds up to 17.8 fl oz. Appellation Beverage Napkins: A 20-pack of 3-ply paper beverage napkins with a wine bottle illustration. Napkins made from oxygen bleached tissue, using water-based colors.